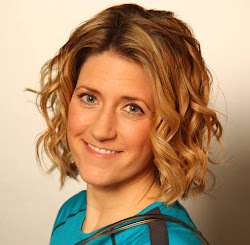 Pt Mollie: Active Travel: London, stay cool! Active Travel: London, stay cool! In the last few months, I have been lucky enough to try a few things in London that are perfect for hot summer days. 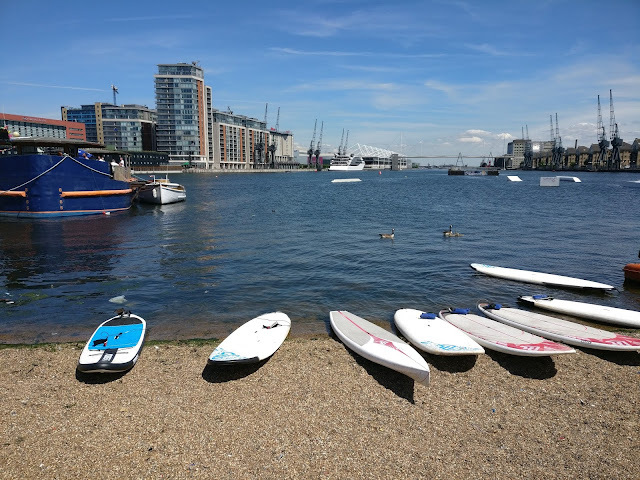 Whether you are visiting during summer vacation or local resident, check out these options to stay cool in sunny London. Ellis Brigham invited me down to their Covent Garden store in early May as part of the #HerOutdoors campaign. They are encouraging women to find the right kit for exploring the great outdoors. We spoke to major active brands Keen and Osprey about what products they have to offer women specifically. Read my review of the Keens boots here and Osprey bag here. Strapped in but still need my spikes. I was most excited to enter their frozen world at the back of the store to try ice climbing, Vertical Chill. This is something I had never done before and I thought I would be rubbish at it because I am not great at wall climbing. The store staff suited us up in long pants, jackets, boots, helmets, gloves, and spikes on our shoes. We had a safety chat once we enter the 3-story-high room with three walls covered in ice (the fourth is a large window). 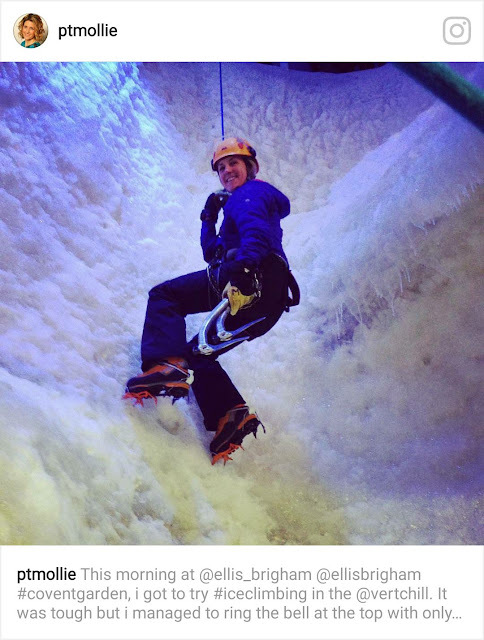 The basics of ice climbing are to jam your toe spikes into the ice so your foot is perpendicular to the wall and wider than shoulder-width. Then you throw your pick deep into the ice above your head, shoulder-width apart. Finally, pull yourself into a standing position against the ice. Simple, right? I took the easy route to the top of the wall, falling off once or twice. I was belayed by a store employee and felt safe at all times. When I got to the top, there is a cow bell to ring in victory. Sessions start at £25 per person. You can get more info and book in here. 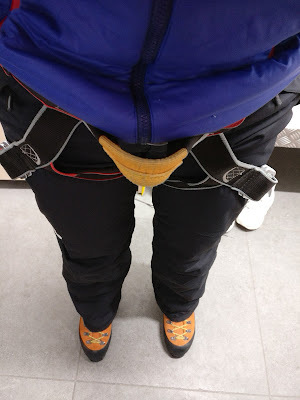 Please follow the instructors' advice when ice climbing and not my novice summary above. Safety first! A few summers ago, I was able to try SUP yoga and really enjoyed being on the water. I have always wanted to live one hour from the mountains and one hour from the ocean, but London doesn't quite meet this criteria. 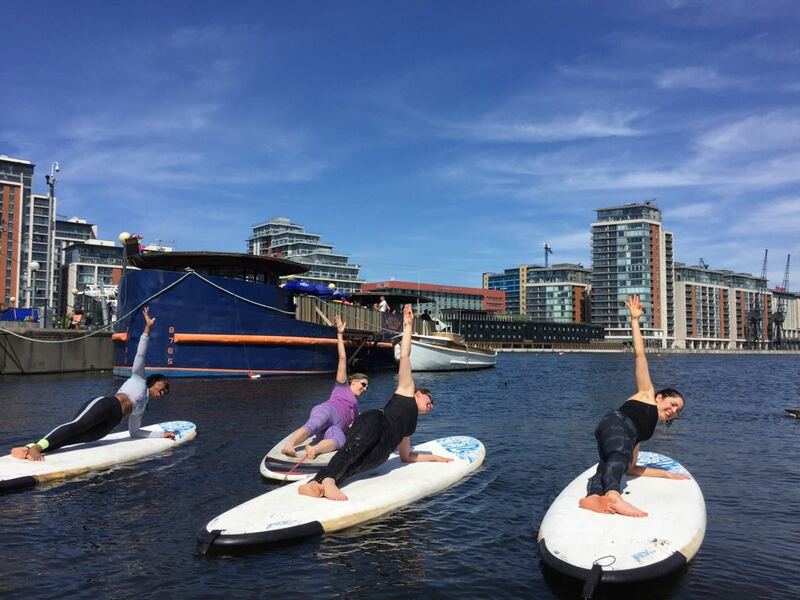 When I got an invite to try SUP Pilates here in town, I dove at the chance. Wake Up Docklands (WUD) is located near Royal Victoria DLR station and underneath the Emirates Air Line. 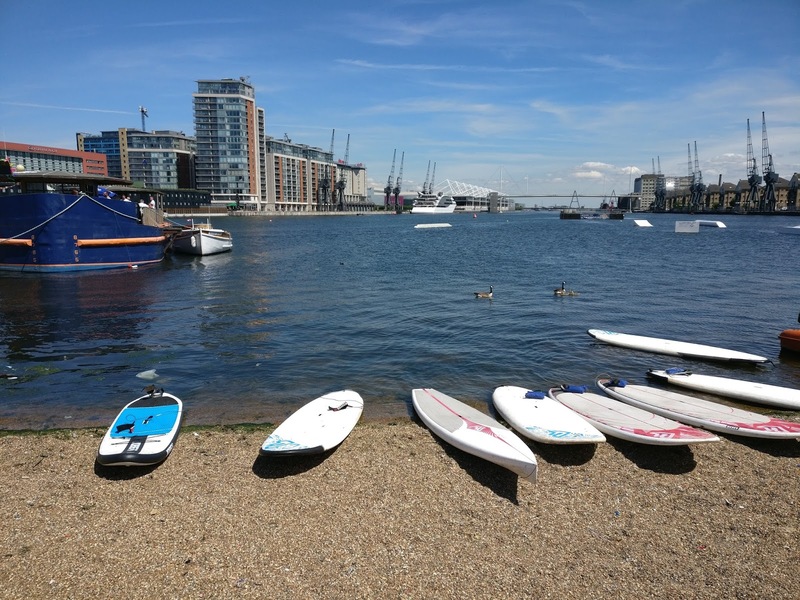 It opened in 2012 and offers a mechanical wakeboarding line with jumps and paddle board hire. The taster session I attended was for bloggers and was divided into a 45 min SUP Pilates session with Ruth Tongue and a 45 min SUP introduction with Jason, owner of WUD. 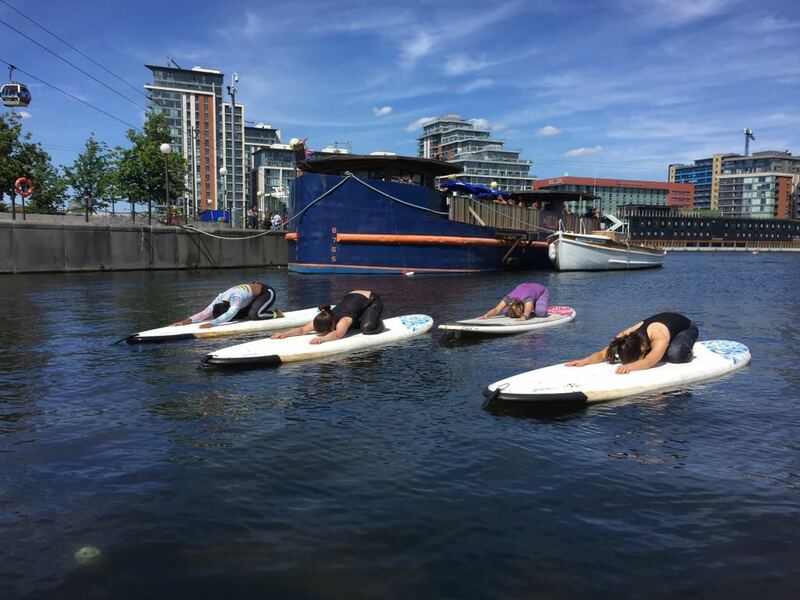 The boards were anchored in shallow water during Pilates which meant you didn't have to worry about floating away. Ruth was also on a board and tailored the class to our ability and comfort level on the water. The boards are actually really sturdy and none of us fell in during Pilates. The board adds an extra challenge to your workout because the instability of floating means your muscles have to work a bit harder. You will get wet up to your knees wading to the board and from laying on the board itself after you stand up after wading out. We all wore activewear instead of swimsuits and it worked out. 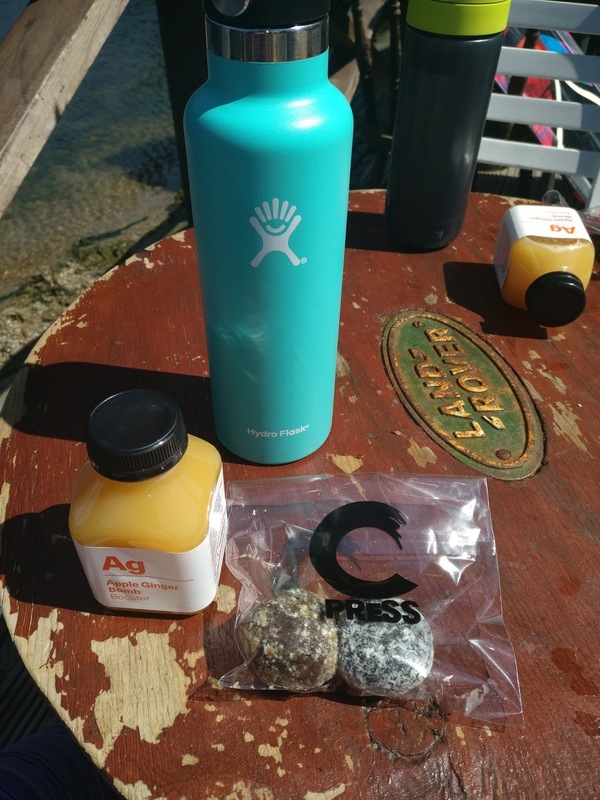 We were treated to some delicious juice and energy ball from C Press between sessions to refuel. The weather was absolutely amazing and chilled out tunes were coming from the speakers on the deck that overlooks the water. You didn't feel like you were in London but instead someplace warm and tropical. For our intro SUP session, we all received life jackets and a paddle. We could have wore wetsuits, but it was very warm out. The lesson started on land, with a review of what the different parts of the paddle were called and how to paddle most efficiently. We then mounted our boards and set off. Initially, we stayed close to shore to figure out how to turn, brake, and avoid colliding with each other. Once Jason was happy with our skills, we ventured a little further to an open area where we had more space to maneuver. It was over here where I fell in as I tried to paddle more efficiently. The good news is that I didn't loose my sunglasses. Seven Islands Leisure Centre recently reopened its pool after it underwent refurbishments as part of a £2 million investment in the facilities at the centre. The revamped 33m pool is now open for public swimming. All borough residents are now able to use the gym and swim for free* at Southwark Council leisure centres. 33 m pool is pretty long for London. Get those extra laps in. 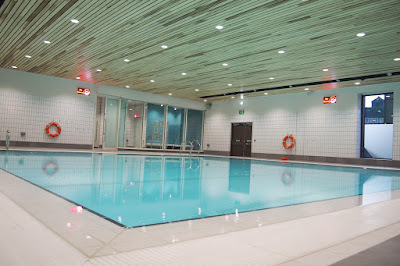 The Castle Centre recently underwent a £20 million redevelopment, and now boasts two brand new swimming pools; a 25 metre six-lane pool and a learner pool with a moveable floor, as well as a sauna and steam room. All borough residents are now able to use the gym and swim for free* at Southwark Council leisure centres. The learner pool is a great place for small children. 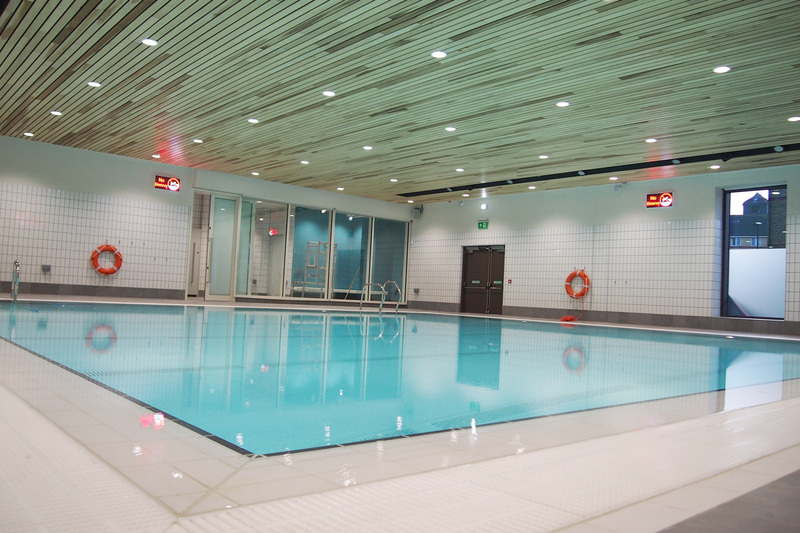 Marshall Street Leisure Centre is situated in the heart of central London, off Oxford Street. 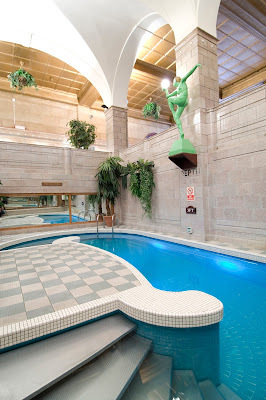 This beautiful grade II listed centre has something for everyone, with a beautiful, fully restored pool with marble floors dating from the 1930s, as well as a spa where you can pamper yourself after a swim. I think I am going to have to check this spa out. The Porchester Centre has recently undergone a £1.2million refurbishment and has two beautiful swimming pools and a lush spa. Visitors will experience in an oasis of calm with its traditional decor of green and white tiles and original features still intact from when the building was built in 1929. What other suggestions do you have for people to stay healthy in London this summer? Leave a comment below. *T&C apply, see Everyone Active website for more details.